If you have been in church for any amount of time, or been around Christians, you’ve probably heard Jesus referred to as the Savior. But why do we even need a Savior? Aren’t we good enough already? The reason we need a Savior is because we are sinners. Sinners are those who rebel against God. They don’t desire God. They don’t want to please or obey Him. They want nothing more than to get rid of God. Since we are sinners, we don’t have a relationship with God. We are actually enemies of God. The Bible tells us God will punish His enemies. Jesus is our Savior. He saves us from the punishment we deserve. The way He saves us is by taking our punishment for us. A professor of mine in seminary sets Friday nights aside for Friday Family Fun Night. One Friday Family Fun Night, they had gone out to dinner and were going to rent a movie. On the way to video store his son started misbehaving in car. He was picking on his sister. His parents told him if he didn’t quit, he wasn’t going to be able to watch the movie with the family. Instead he would have to sit in his room by himself. Like any little boy, he listened to his parents for awhile, but when they got to the movie store, he started acting out again. When they got in the car, his dad told him he wasn’t going to be able to watch the movie with them and would have to spend the rest of the night in his room. He couldn’t believe it. He wasn’t going to be able to watch the movie. The movie he picked. The one he had waited weeks to see. On the way home, he apologized, not just to his parents, but to his sister as well. It was obvious he was remorseful for what he did. He wasn’t just saying he was sorry so he could watch the movie. His dad saw an opportunity to teach his son about what Jesus did. He told his son, “You misbehaved earlier. Someone has to be punished for that. But instead of you sitting in your room, I am going to take your punishment for you. I will sit in your room, so you can watch the movie with the family.” So the father willingly took his sons punishment that night so he could enjoy the movie. That’s what Jesus does. He willingly took our punishment, so that we might enjoy eternal life. 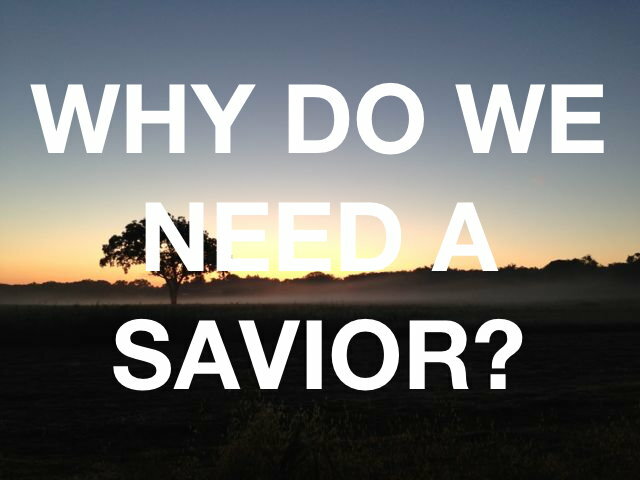 The answer to our question – Why do we need a Savior? – should be clear. We need a Savior because we deserve punishment. As God’s enemies, we want nothing more than to get rid of Him. Destroy Him. Reign in His place. God, however, is the rightful ruler of this universe, not us. God punishes His enemies. Jesus, however, takes our punishment for us. He saves us from God’s wrath by dying the death we deserve on the cross. i think god rewarded/punished jesus for so faithfully claiming to be an only child.. what about the rest of us?? Thanks for your comment, but I am not sure I follow what you are getting at. Could you be more specific? Thanks for your thoughtful reply. You have hit on a lot in your comment. I won’t have time to address everything, but will provide some meaningful responses. To say that there is not a “one size fits all god” is a relativistic idea. One that doesn’t work in reality. The Law of Non-Contradiction states that something cannot be both true and not true at the same time when dealing with the same context. So for instance, if I say that Yahweh is the one true God and a Muslim says Allah is the one true god. We both can’t be right. To say we are both right is a contradictory statement. Your position – everyone has access to god no matter their religion – is not exempt from the Law of Non-Contradiction because you are putting forth a religious belief just like Christianity, Islam, Buddhism, etc. Your idea that everyone has access to god no matter what contradicts the other major religions idea that there is only one way to God. Both cannot be true. With options (1) and (2) they pay a debt. No forgiveness is offered. If you, however, choose option (3), you have absorbed the cost. You have forgiven their debt to you. Option (3) is what the Christian God chooses. Jesus, the 2nd person of the Trinity, God incarnate, absorbs the cost of our debt by dying the death we deserve. Paul in Romans tells us “the wages of sin is death.” Jesus pays that payment for us on the cross. Since He pays our debt (absorbs the cost), He is able to forgive us. You see, true forgiveness is not possible unless someone pays a price. If you choose to forgive someone, you pay that price. If you choose not to forgive someone, they pay the price. God offers us forgiveness, and in order to do that, He pays the price. He absorbs the cost. He pays our debt. A debt we are incapable of paying. Another thread you hit on in your comment is the idea that god is who you think he is. But I would challenge you with the idea that a god of our own making is not a god at all. If our god cannot disagree with us, then he isn’t god. He is just a figment of our imagination, something we have conjured up to make ourselves feel better. God by His very nature is an infinite being who is much greater than us. An infinite being who created us. An infinite being who has the right to rule our lives. If our god doesn’t have the right to rule our lives, then is He really god? Another idea you touched on is tolerance. I believe this word is completely misused today, and its idea has changed. True tolerance means that we will tolerate others ideas. We will allow them to live in our communities without fear of persecution for what they believe. We can have meaningful dialogue and maybe even hang out with them. The idea of tolerance today is that we must not only live next to others, but we must accept their beliefs as if they were true. If we don’t accept their beliefs as true, we are intolerant. Take homosexuality for instance. I am fine living next to and interacting with someone who is homosexual. I don’t agree with their lifestyle, and I believe it is a sin, but I will not persecute them for it. I won’t, however, agree with them that their life choice is right. I won’t accept it as if it is not sin. I will preach the gospel to them and encourage them to repent. For that, some will label me intolerant. But that misses the definition of the word. Because tolerance is the ability or willingness to tolerate something, in particular the existence of opinions or behavior that one does not necessarily agree with. So to tolerate something doesn’t mean the whole sale acceptance of it. Thanks again for the comment. I enjoy interacting with others. You have given me a lot to think about and interact with. I could not begin to address it all, but hopefully this is a start. Happy to talk more. I dont believe much in ‘free will’ and often imagine hell as the process of the soul’s ability/inability to let go of the decaying body that we were so attached to in life.. a bit of eastern philosophy i suppose, but I feel defining “punishment” is what we make of it- as in the needs to repent create our own karmic plane of ‘good’ and ‘evil’ existence (I am a student of the psychological arts, and this is what we’d term the ‘Superego’). I would place a gay and straight person on the same standards of judgment, weighed only by their outward rippling actions (ie their positive or negative influences on the surrounding environment). I don’t believe in a final ‘Judge;’ however I still see the Universe as being able to sort itself out justly. The best evidence of God in my opinion, is the supra-human complexity of the Mind. (1) If you believe the universe can sort itself out but you don’t believe in a final judge, how does that work? (2) How do you know and trust the universe will sort itself out justly? (3) If you don’t believe in a personal God, what is your basis for justice? (4) What do you base good and evil on? You mention a karmic plane, but how do you know what you are doing is good or evil? (5) What would you consider to be positive or negative influences on the surrounding environment? (6) Why should I believe in or agree with your positive or negative influences? (7) How is punishment punishment if it is just something we make up on our own? Could I not make up what I call punishment but it really not be punishment at all? If that is the case, is justice really being served? I hope to get you thinking.